Once a vitrine for technical innovation; the first woven Jacquard images were inspired by the popular imagery of the time and produced by different workshops to show their technical proficiency. These textiles images of everyday scenes soon became popularized. Nowadays, when we get bombarded by thousands of images everyday, which images are worth taking the time to materialize? What does an image that is also a piece of cloth as to say to us about the value we are giving it? In this workshop, you will be introduced to the Pointcarré Textile CAD software for the Jacquard loom. You will learn the first steps of transforming an image into an intricately woven piece of cloth and how to turn your digital file into a haptic piece of art, an image that you can touch and feel. You will explore the art of making an image by using the structures of crossed yarns in patterns that will shape its highlights and shadows, hence simulating a fabric in which the raised design is incorporated into the weave instead of being printed or dyed on. You are invited to bring an image to work with. 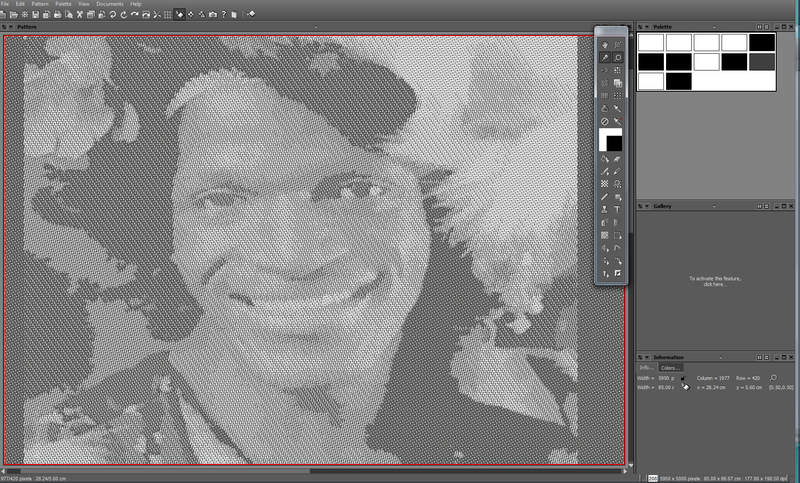 The resolution of the image will be brought down to 60 dpi, so even a screen capture will be good. Please note: only experienced weavers are authorized to operate the Jacquard loom. There is a possibility to have your image woven in the weeks after the workshop in a size of about 12 x 12 inches. Limited space available. Registration on a first-come, first-served basis. Please e-mail textiles.materiality@concordia.ca to register for the workshop.